Tempus Rerum Imperator: Time, Emperor of All Things. 1758. England is embroiled in a globe-spanning conflict that stretches from her North American colonies to Europe and beyond. Across the Channel, the French prepare for an invasion - an invasion rumored to be led by none other than Bonnie Prince Charlie. It seems the map of Europe is about to be redrawn. 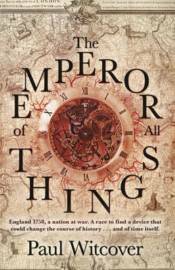 Yet behind these dramatic scenes, another war is raging - a war that will determine not just the fate of nations but of humanity itself...Daniel Quare is a journeyman in an ancient guild, The Worshipful Company of Clockmakers. He is also a Regulator, part of an elite network within the guild devoted to searching out and claiming for England's exclusive use any horological innovation that could give them an upperhand, whether in business or in war. Just such a mission has brought Quare to the London townhouse of eccentric collector, Lord Wichcote. He seeks a pocket watch rumoured to possess seemingly impossible properties that are more to do with magic than with any science familiar to Quare or to his superiors. And the strange timepiece has attracted the attention of others as well: the mysterious masked thief known only as Grimalkin, and a deadly French spy who stop at nothing to bring the prize back to his masters. Soon Quare finds himself on a dangerous trail of intrigue and murder that leads far from the world he knows into an otherwhere of dragons and demigods, in which nothing is as it seems ...time least of all.